Fanatically Happy Day! 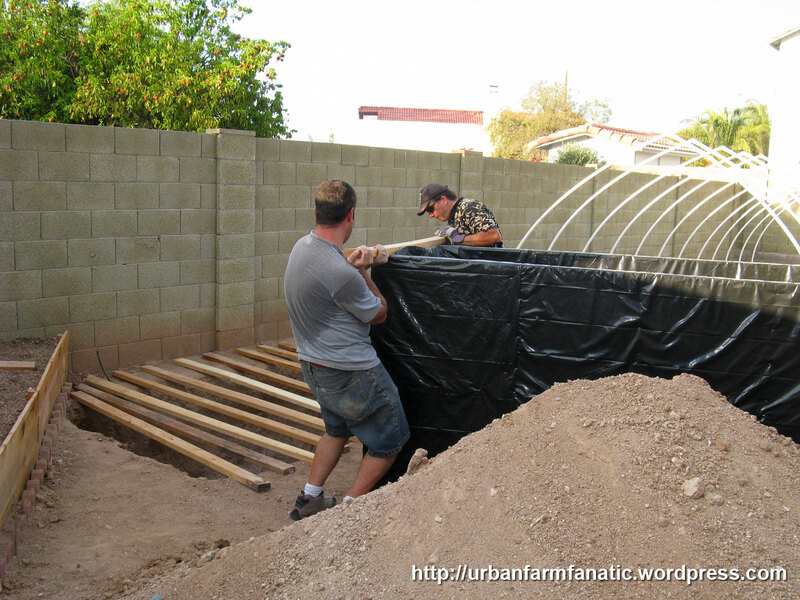 – The Aquaponic Tank is in the Hole!!! Originally the idea I had in mind was to get 3 extra people together and coordinate a time to have them come over to lend me their muscle lowing the tank in the hole with some large rope. Problem was I could never get everyone together on the same day. Family plans and being out of town were the main reasons. This then made me research hiring some movers to come out and help me get the tank in the ground. Well that plan was also a no-go as I was repeatedly getting quotes somewhere between $240-290 dollars to have them come out and put in an hours worth of work (uh uh). What finally ended up happening was that my friend John, who has many cogs and gears whirring through his head at any given time, helped devise a game plan that involved the use of 1 inch PVC to act as rollers underneath the tank to get it from my porch to the other end of the yard. 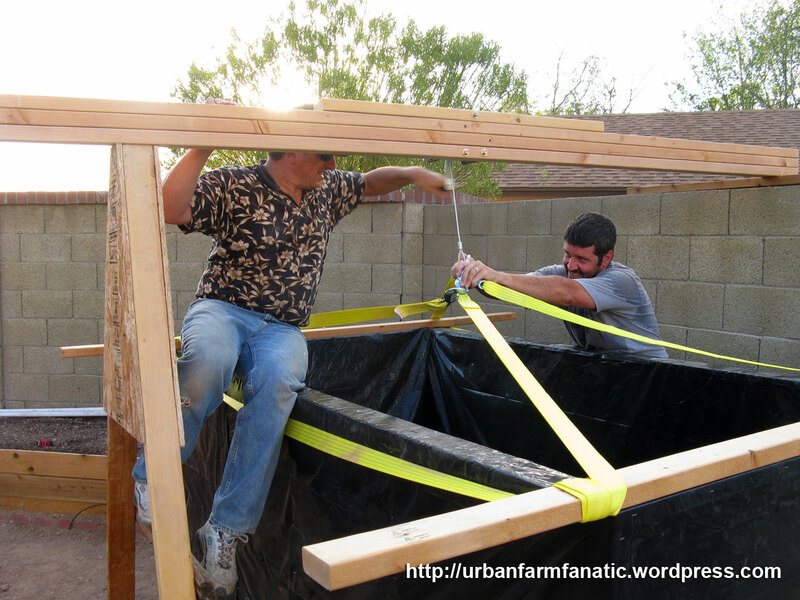 He also help devise a sketched idea of using an a-frame gantry and a winch that we used to span over the hole. 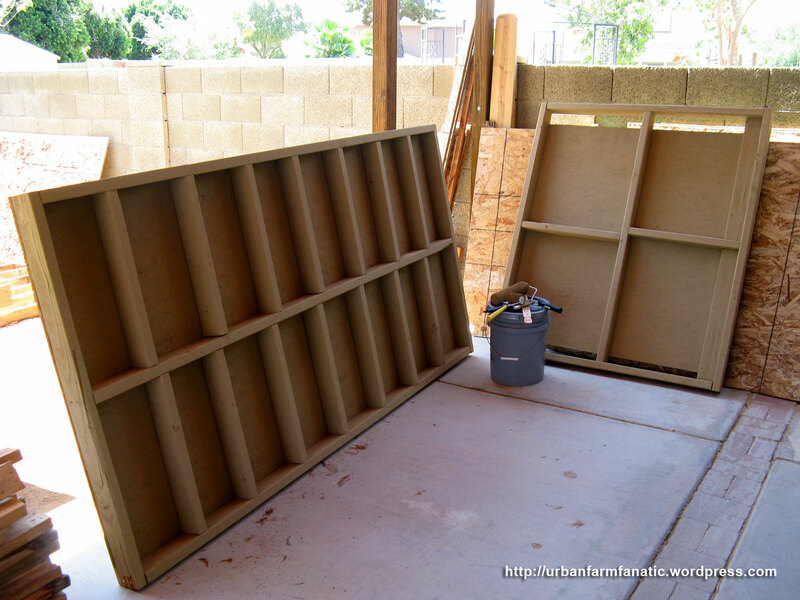 My job was essentially getting the needed materials together and building it. So with this new plan in mind, I paid a visit to a local Harbor Freight and got my hands on a hand winch and straps with hooks. 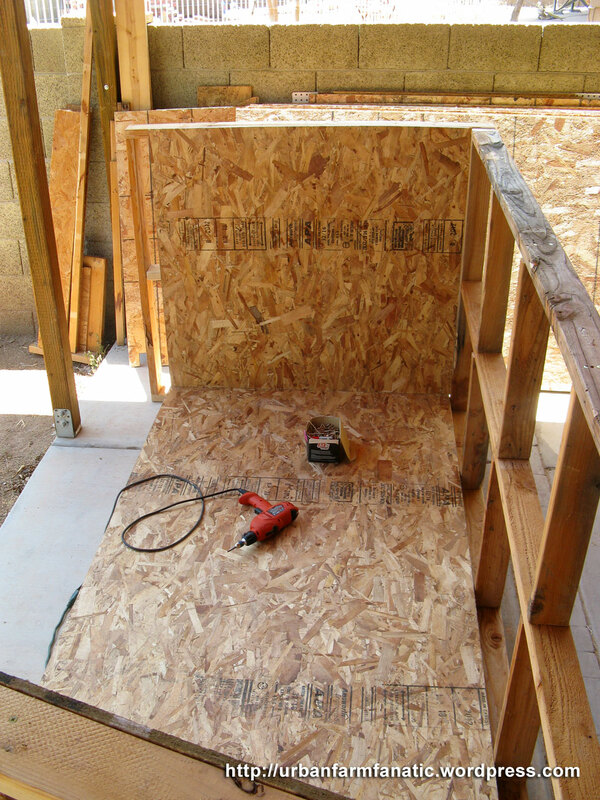 I then was able to piece the A-frame portion together with some 2×4’s, OSB board and some 3/8″ lag screws. For the gantry portion going over the hole I had to purchase three lengths of 2x4x10’s (as all I had was 8ft lengths at home which were too short). These lengths I then screwed together with deck screws and then mounted the winch in the center. These eventually showed me a few issues that I needed to overcome. One, the hand winch is the cheapest unit I could find at Harbor Freight (rated for 2000 pounds, the tank I figured was pushing about 6-800 pounds).. this winch had originally been placed on the bottom of the gantry, but that proved to not be a workable idea since the design of the winch did not allow for a cleared area of the cable and hook away from the hand crank, essentially eliminating my ability to crank it up and down. 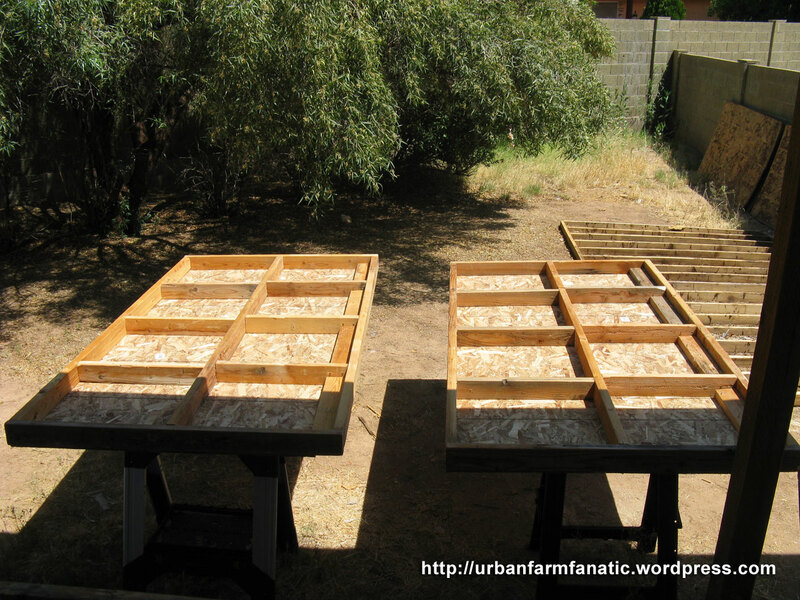 The solution was to detach and re-attach the unit on the side versus the bottom of the 2x4x10’s. Because of this I need to add a 4th, shorter piece of 2×4 so that I could accommodate the entire footprint of the winch on the side. Immediately I could see that this would cause some serious torque happening on the overhanging gantry, essentially setting it up for failure by twisting to the point of falling off the A-frame support. To negate this, I added a 2×6 piece at the end overhanging the cinderblock wall on the other side, giving the gantry some much needed leverage. 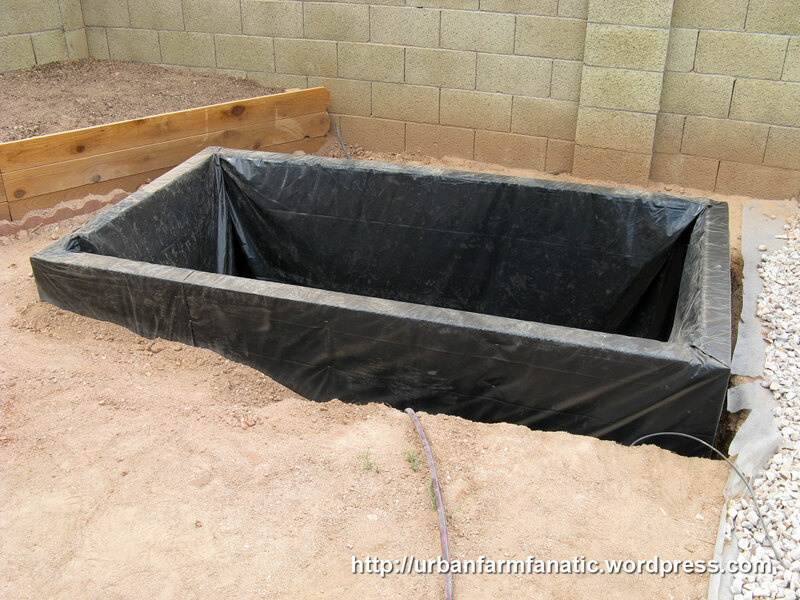 In the end the whole system was a one-time use setup, so as long as it did the job of getting the tank in the hole, that’s all I cared about.. and… it worked! We needed to constantly work on maneuvering the tank into the hole cause I made the size of that hole only inches of clearance on each side (this did require some modification on our part with a pick ax and shovel before hand as we found a few areas that would not clear the tank.. my bad). 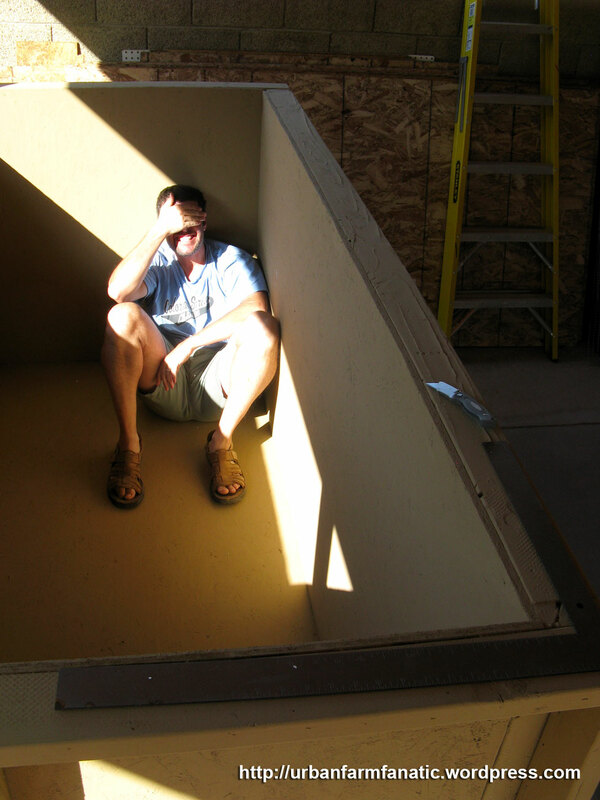 The last aspect of this endeavor was that we were doing it in Summer in Phoenix. Even though the sun was not directly on us at the time of the lowering. It was still reading 108-109 outside. Yeah, we’re a crazy bunch for doing this in that heat, but it was either that or wait till September to get it done when the temps drop… uuuuh NOPE! So, to say I’m ecstatic about the tank finally being in the hole is an understatement! 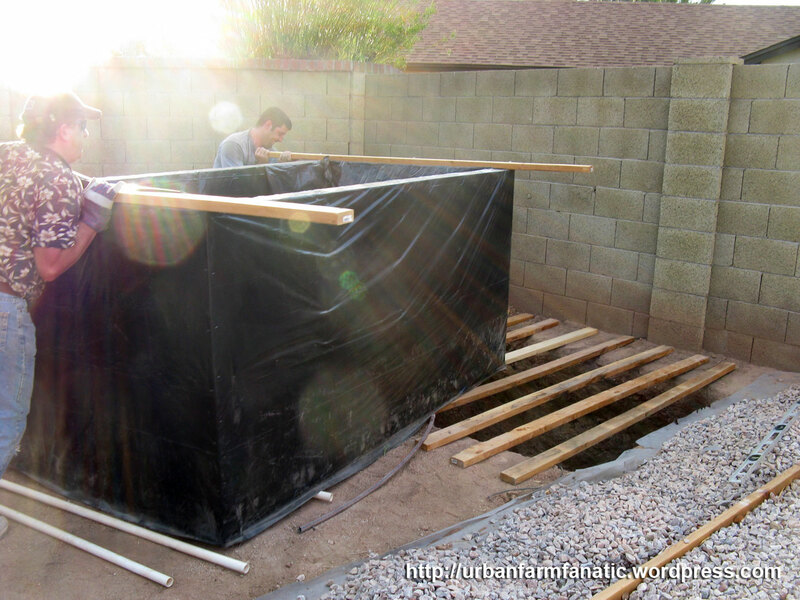 The next steps of my progress will be to back fill the areas around the tank, add in the pond liner, start in on the end frames for the greenhouse and get started on building at least 2 grow beds to get the system started on cycling. Obviously I’ve still a ways to go, but now I’m no longer bottlenecked going forward! WOOT! BIG, BIG, BIG thanks to my buddy John for all his help on this project.. a true friend to the end! Fanatic Dig! – Dang! – Dug! – Done!!! WHEW!!! 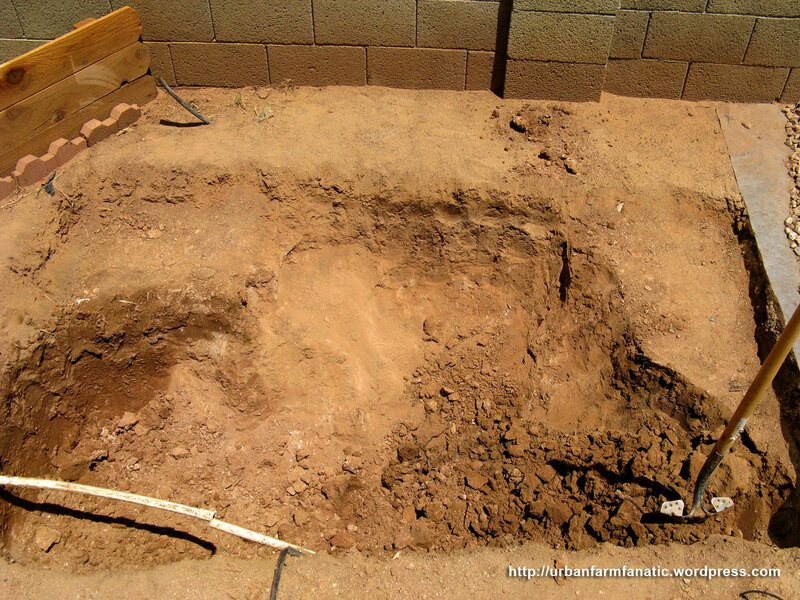 Woe be the person whom has to dig a hole in the Arizona desert!!! 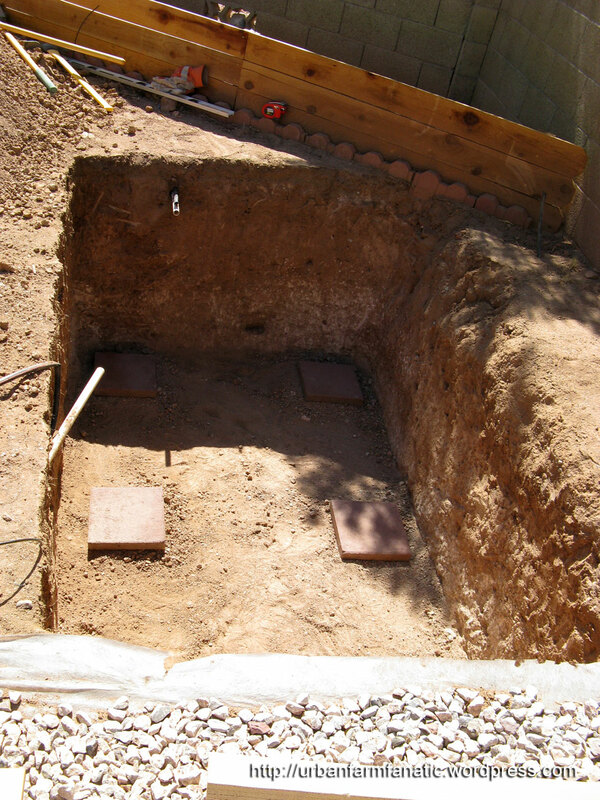 I say this to start off my topic, because if you have ever wondered why nearly 98% of the homes built in Phoenix DO NOT have a basement, you will understand why shortly after you’ve laid your shovel into the Phoenician soil. This stuff is nasty!!! It can be summed up by one simple word… Caliche. Caliche occurs in the subsoil, the layer beneath the surface soil. Caliche is common throughout Arizona. 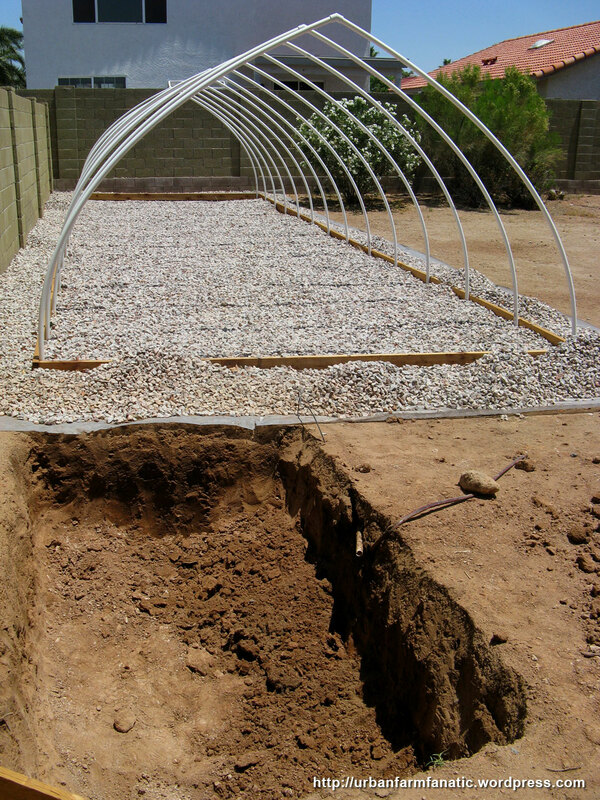 It is a layer of soil that can be up to six feet deep and the soil particles are essentially cemented together with calcium carbonate. Hand-digging a hole in caliche soil is next to impossible and any serious digging requires a jackhammer (of which I did not have on hand). The means by which I was able to excavate my hole was made possible by running the hose on the area overnight and letting the ground soak a good 12 hours before putting shovel to dirt. All in all the final dimensions came to 8 feet, 7 inches long by 4 feet, 5 inches wide by 3 1/2 feet deep and took all of 4 full days of shoveling, or about 32 hours total. Now, the million dollar question you may have for me, is why go to all this trouble? Well, the reason is very simple… water temperature regulation. 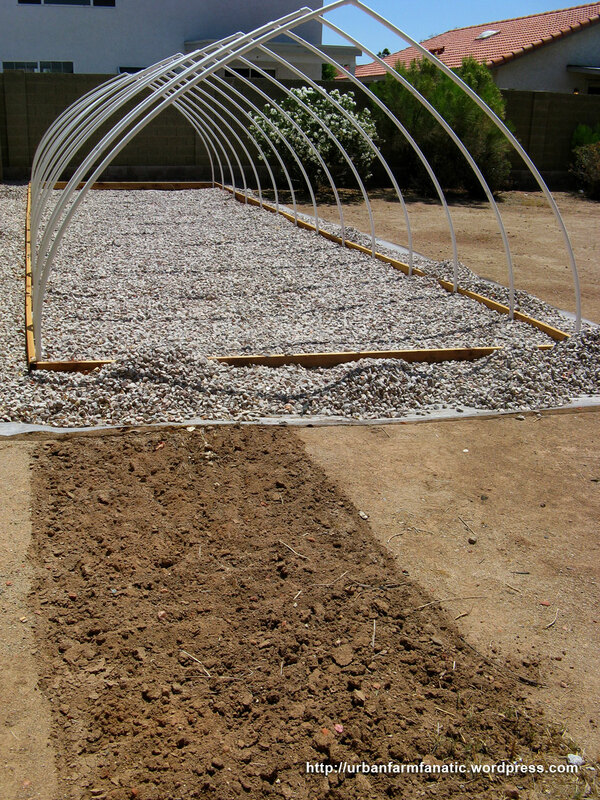 Using the thermal mass properties of the soil, the goal is to keep the tanks water at a steady 75-85 degrees year round. 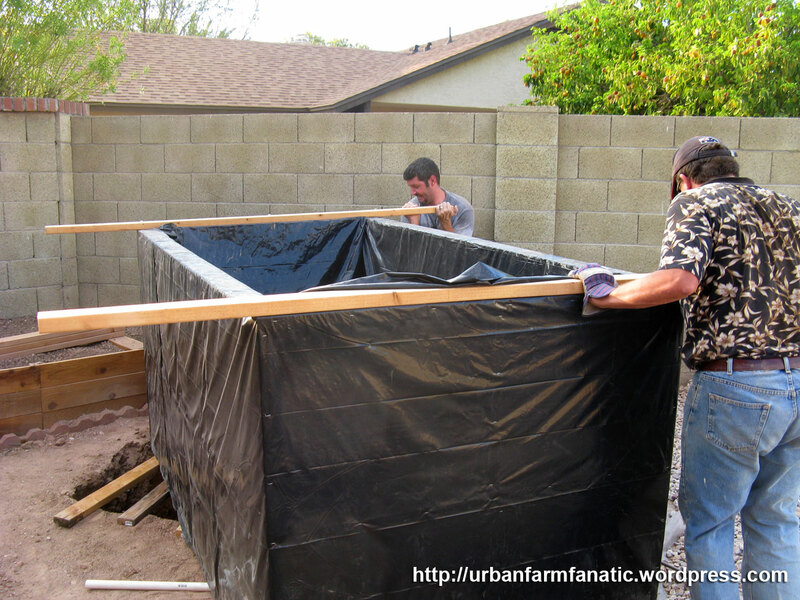 This is also helped by the fact that the tank will hold 112 cubic feet of water or the equivalence of 837 gallons. The more water you have in a system, the more energy that is required to change the overall temperature of that body of water. I did this because as most people may know, our summers here are friggin HOT! Our summer seasonal average puts us around 92 days that are over 100 degrees and at 110 degrees, our average has been over 19 days each year, during the past 30 years. This was one the main reason for all the effort to dig the hole. Our only other option to cool the water would’ve involved misters, but that technique loses a LOT of water through evaporation. Thankfully, this endeavor also serves us well in the cooler months. We’ve found that if we did need to warm the water, its easier and less costly to do with a large aquarium heater, than if we tried to cool the water. Talapia, like any fish, need a good place to stretch their fins. So keeping the temps as close to 80 degrees is going to be our main goal. Any lower and they start to eat less food and become lethargic, thereby decreasing their growth. Any hotter and they will do fine up to say around 95 degrees, but then the plants will suffer. So our goal is to hit that sweet spot between 75-85 degrees year round. In that way we keep both animals and plants happy. 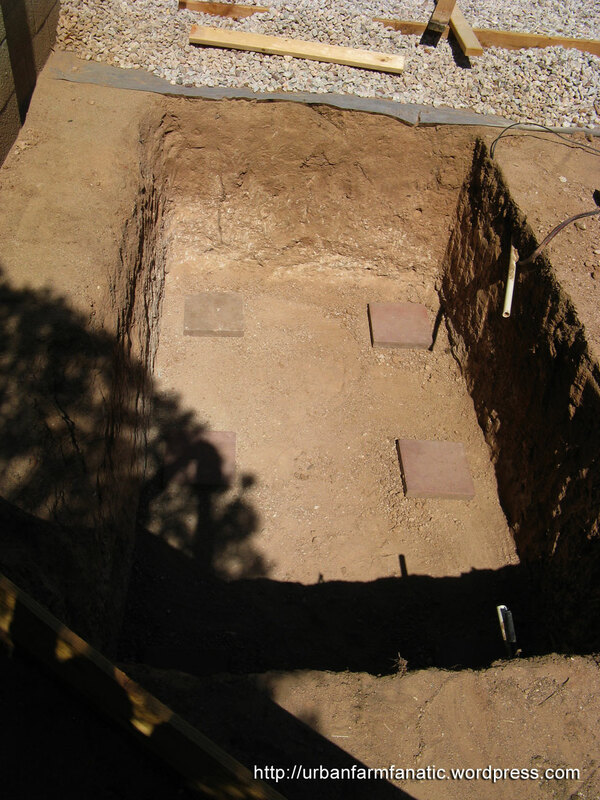 Following the initial dig, I then had to put down some paver stones and work with a level to make sure the base for the tank will be as level as possible. Took a bit more time than I expected, but in the end it worked out fine. The next step is moving the pieces of the tank over to the hole and starting assembly. 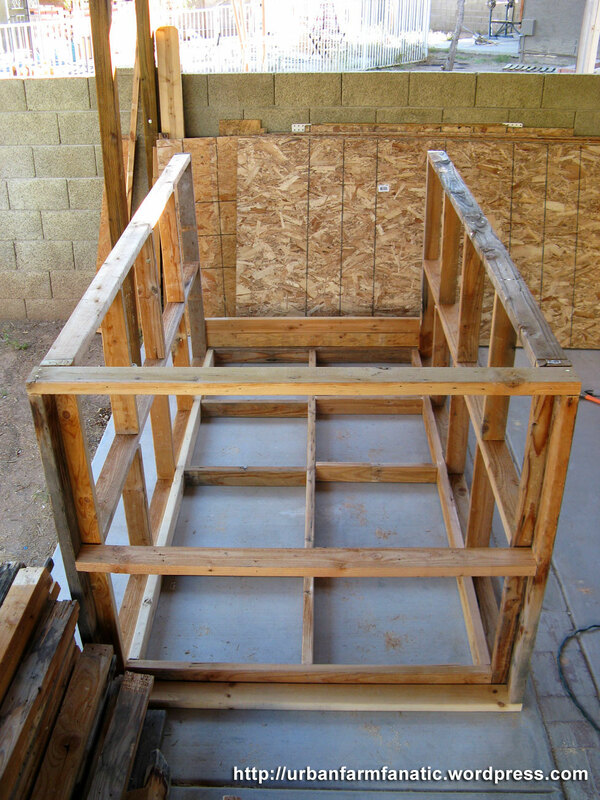 With that I’m doing a bit of overkill by adding in foam insulation on the sides (but not the bottom, as that would negate the purpose of the thermal mass of the hole). 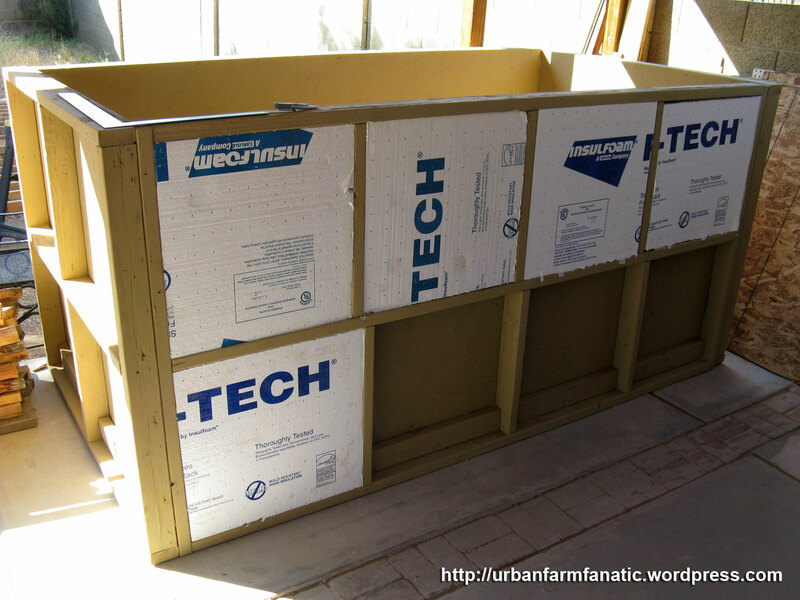 I’ll then wrap the entire exterior with a vapor barrier to add a further layer of protection from the bugs and elements. 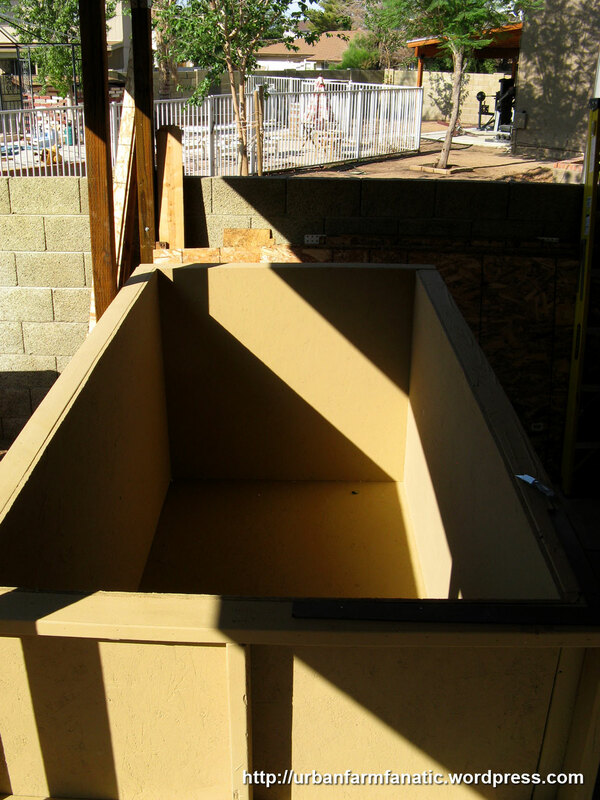 Fanatic Fish Tank Build – Paint Complete – Onto the HOLE! I’m happy with the progress so far. The next item on the list was to get the entire frame for the tank slathered with at least three coats of paint. Mission accomplished! Even had a quick rain storm kick through and the new paint worked like a champ. 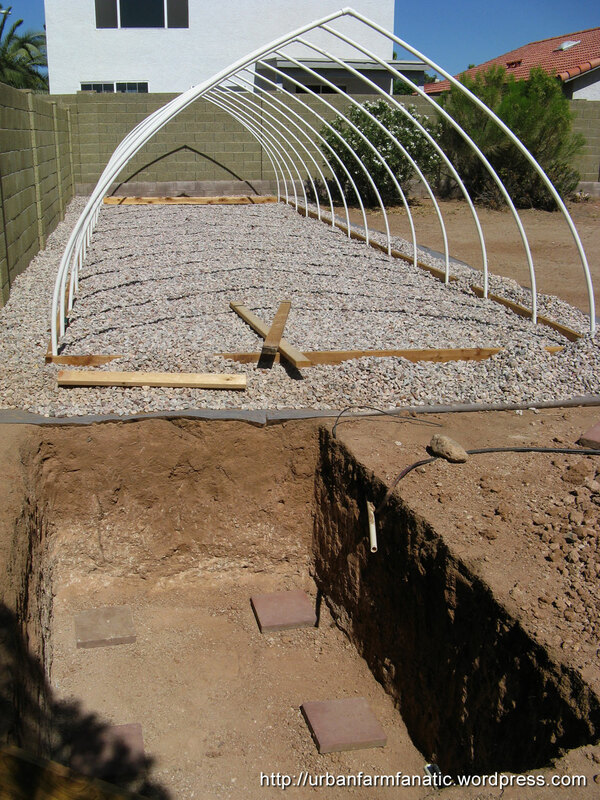 I’ll be getting the framing put together upon completion of the new task at hand, which is digging a very large hole using only sweat equity on my part. 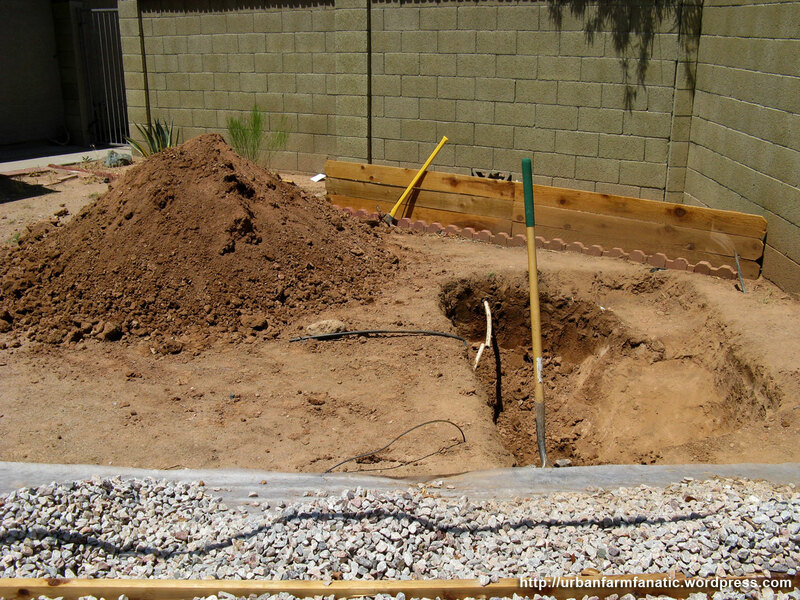 I had thought about renting a jackhammer to get through the unusually hard ground one finds here in Phoenix. But luckily, I took the advice of my best friend and also my wife and ran the hose at a slow trickle the night before I was to dig. Sure enough it did the trick! The ground softened up nicely and I’m currently about half way through the dig. Granted I’m exhausted. The bod is sore. But it was a good days work and progress went much better than day one. 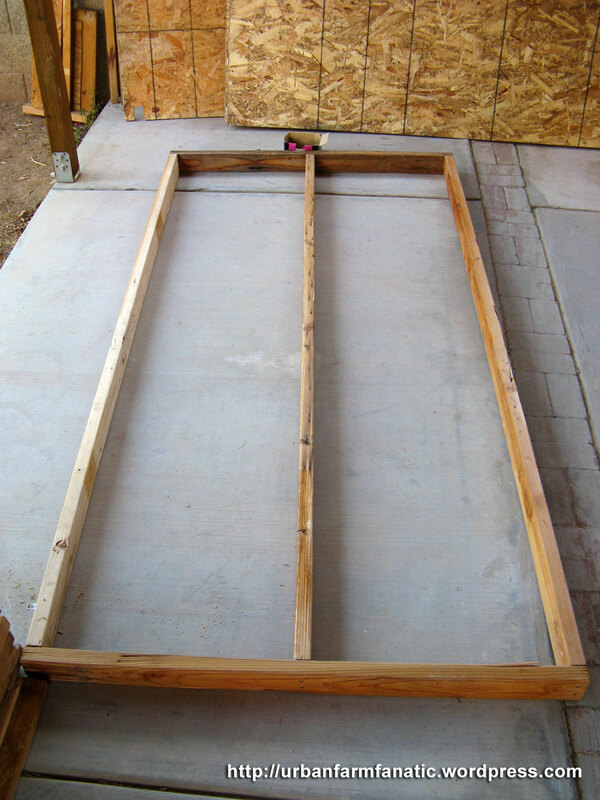 Once I’ve got the hole dug, the question that is pondering my mind is should I piece together the framing in the hole, or just assemble topside, then get a few grunts to help me lower the whole thing. 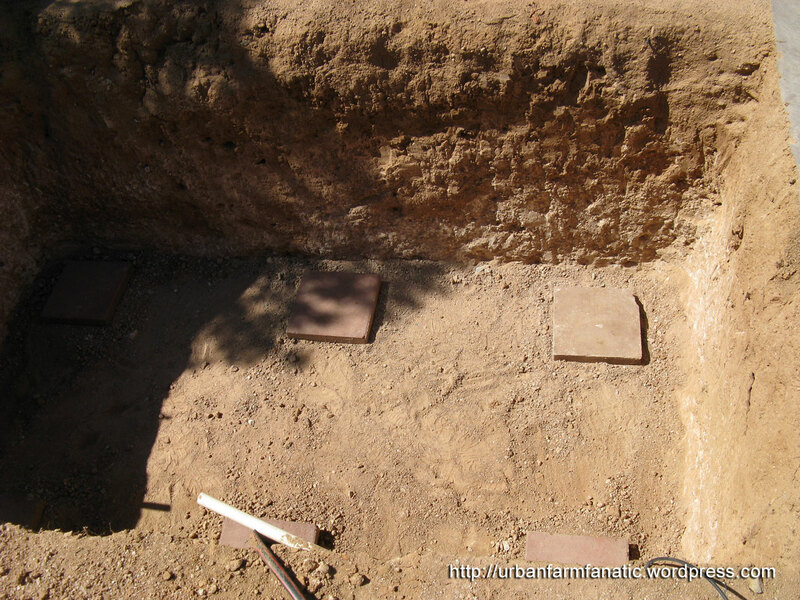 I had recently helped a friend do the same with his own tank burial, and that was not an experience I wish to repeat. Especially since my tank is about 1/4 larger (and most likely heavier) than his. I would definitely say a minimum of 4 people with rope to help lower this beast into the ground. Which is also why I pondered doing the assembly in ground. 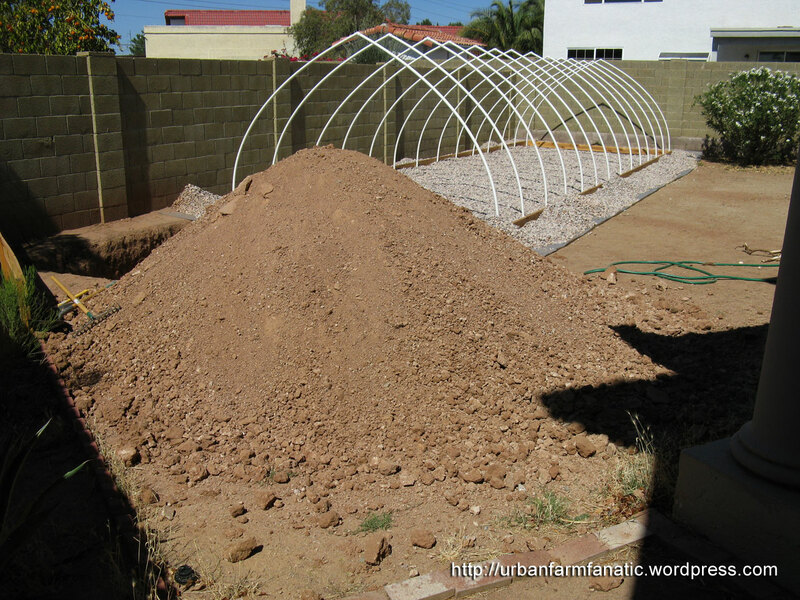 Problem with that idea is that the hole then needs to be dug considerably wider and longer to accommodate a human being. After my recent two digs, I’m a bit put off by that requirement. So most likely I’ll be lowering this beastie with some buddies in the near future. As always, you’ll see it here first! 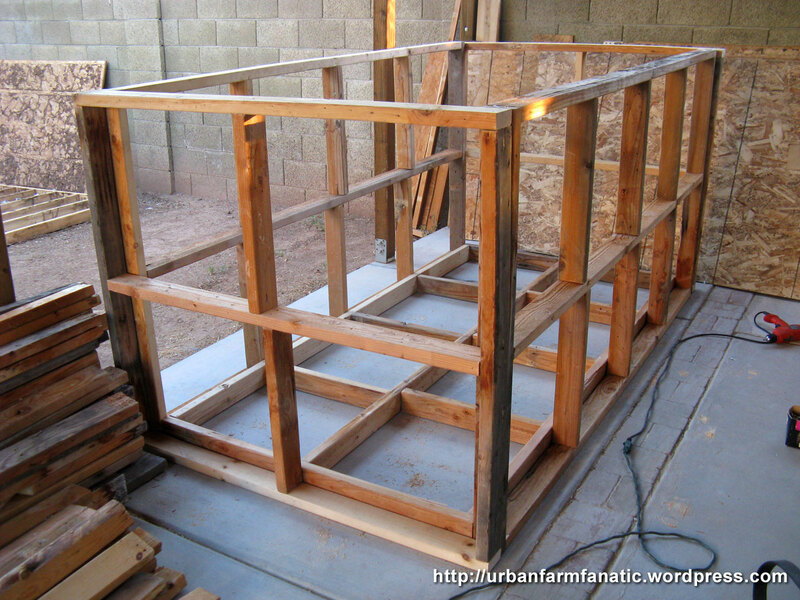 Fanatic Fish Tank Build Continues – Framing Complete! Had some more progress today on the tank build.. man o’ man this is getting exciting! 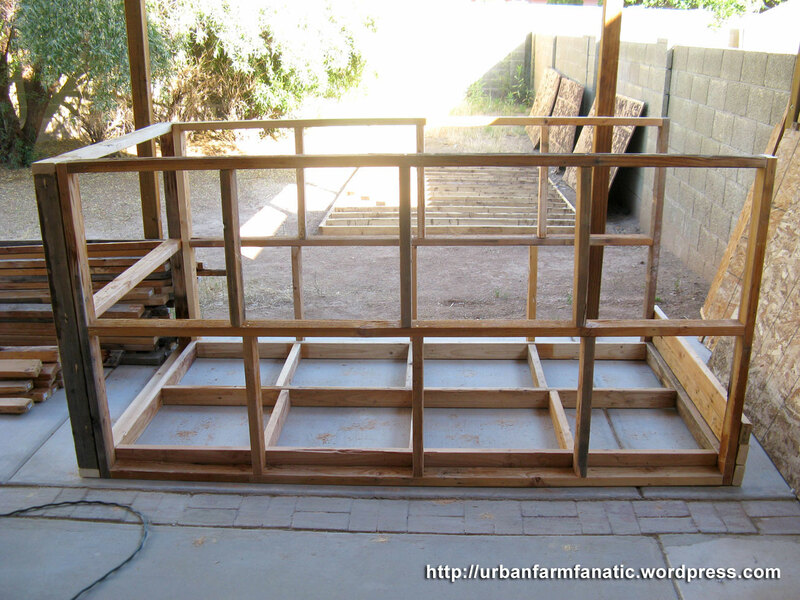 Essentially the framing for the tank is now complete. Per a fellow AP’er on a local forum’s suggestion, I decided to beef up the base of the tank with some additional cross members spaced roughly a foot apart to give it additional strength. 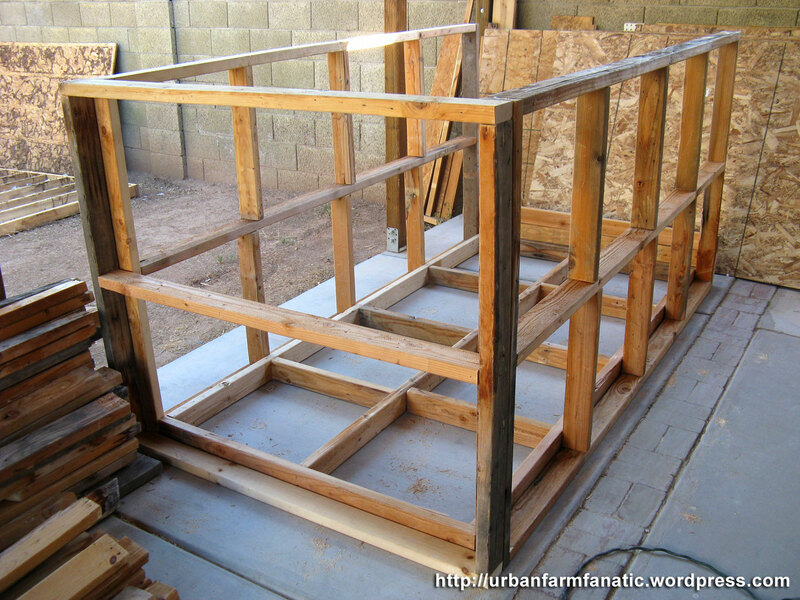 I decided to go this route rather than deviate from using my reclaimed lumber and buying a large piece of thick plywood (that stuff’s expeeeensiiiiive!). The real test came when I decided to take this tubby body and jump up and down all over the base to see if I would cause any bowing between members. Figure at 200+ pounds and hitting a square foot area with all I could muster, its gonna hold! Lastly I did decide to deviate a bit from the use of regular deck screws and go with large 4″ lag bolts to secure the sides and base together. These will DEFINITELY be able to hold up to the shear forces involved with holding 7000 pounds of water. At this stage it now goes to paint. I was able to get a commercial grade outdoor paint at Home Depot on the cheap. Simply go and ask for their ‘reject’ pile. Came across a nice 5 gallon bucket of tan paint which I will apply liberally come tomorrow. The fact that it was 80% off… BONUS! All in all a very productive weekend! Fish Tank or Perhaps Our New Jacuzzi? 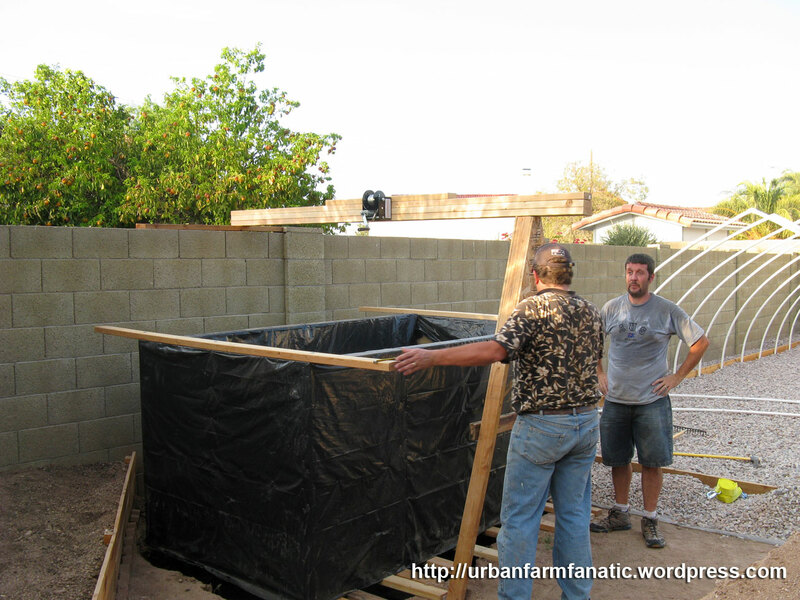 – Aquaponics Tank Framing Begins! I’m a happy guy! Why? Well because I’m finally getting started on the meat and potatoes of our AP build! So with all the reclaimed lumber, I’ve had a busy day of selecting pieces that were not warped. Surprisingly there was little termite damage, but warping seems to be the most prevalent issue with reusing this wood. So took my time, found lengths that had minimal issues and got to cutting! All in all, not a bad Friday’s work! There’s still a bit more work to do. 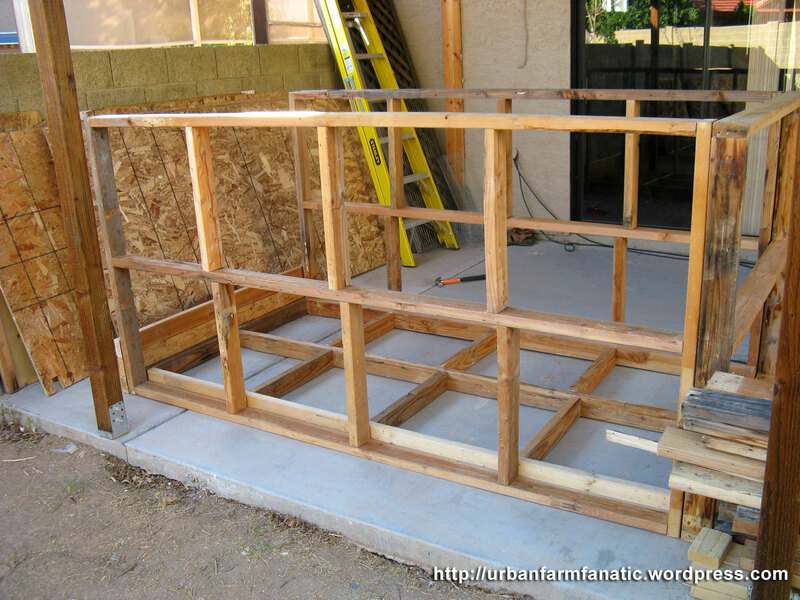 I must get the OSB fitted to each frame piece. 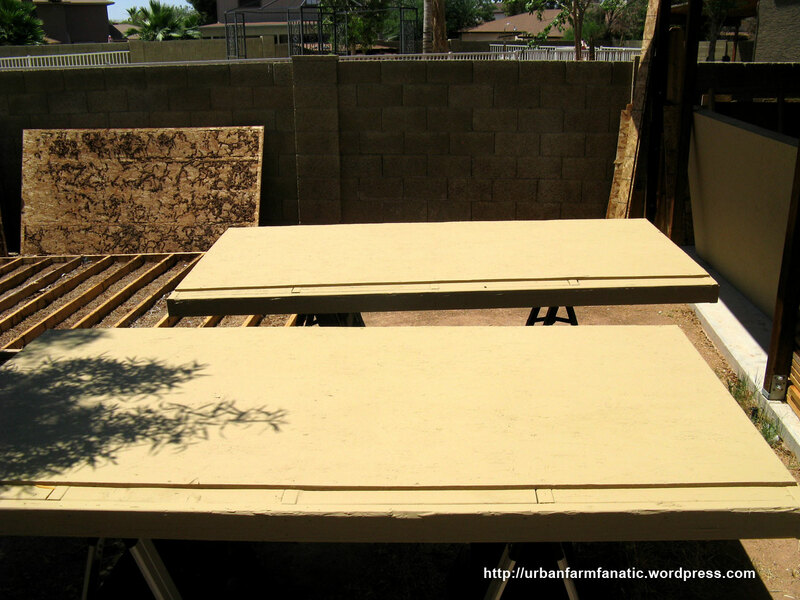 Then comes some outdoor paint to help give the wood some extra protection from the elements (it is after all going to buried in the ground.. more on that later). Then some foam insulation on the inset areas to help keep the water as well insulated as possible. I’m trying to minimize temperature fluctuations as much as possible, which of course might be a little overkill on my part. But that’s how I roll! Much of the framing is pretty straight forward. 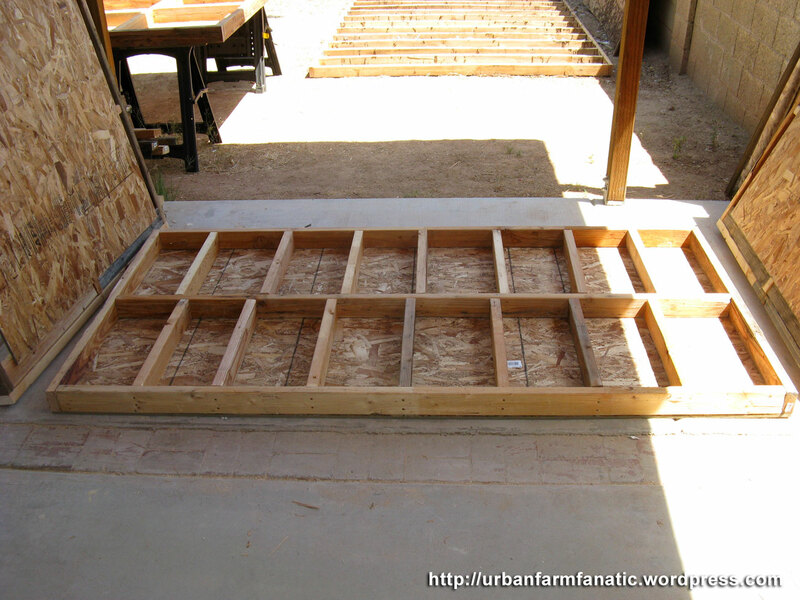 I had to offset the additional support sections so that I could properly screw them to the rest of the framing. I got this nifty little idea from my friend John who has already got his AP system setup and growing food. 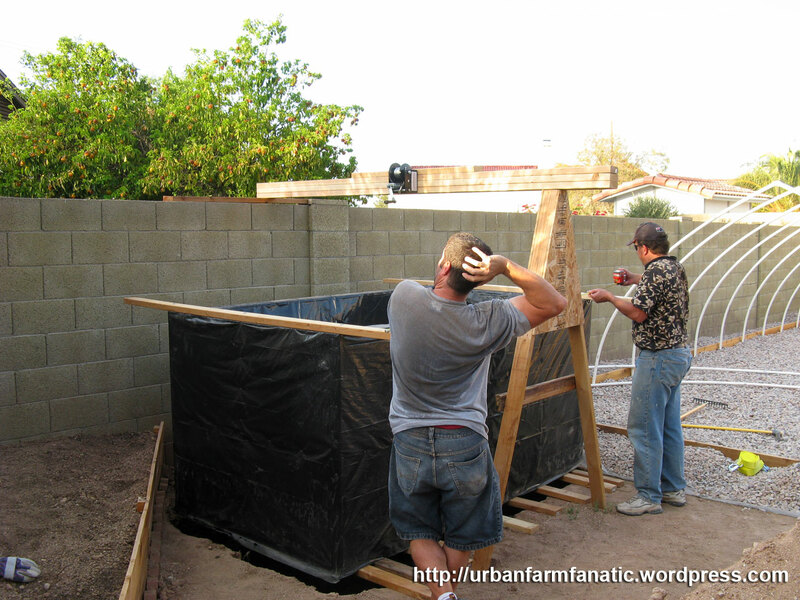 But for the size of the tank.. the idea was to do as little cutting of the OSB board material as possible. 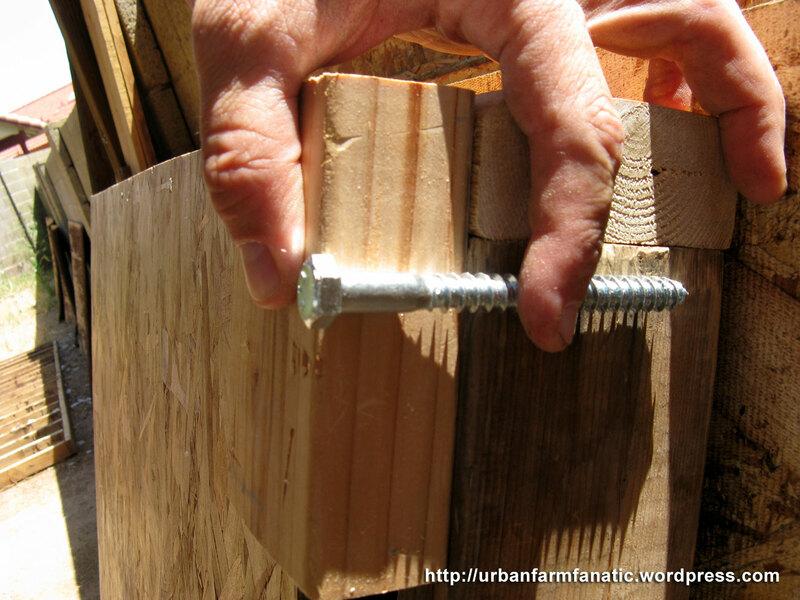 I’ll only have to cut one section in half, then add to each end piece. 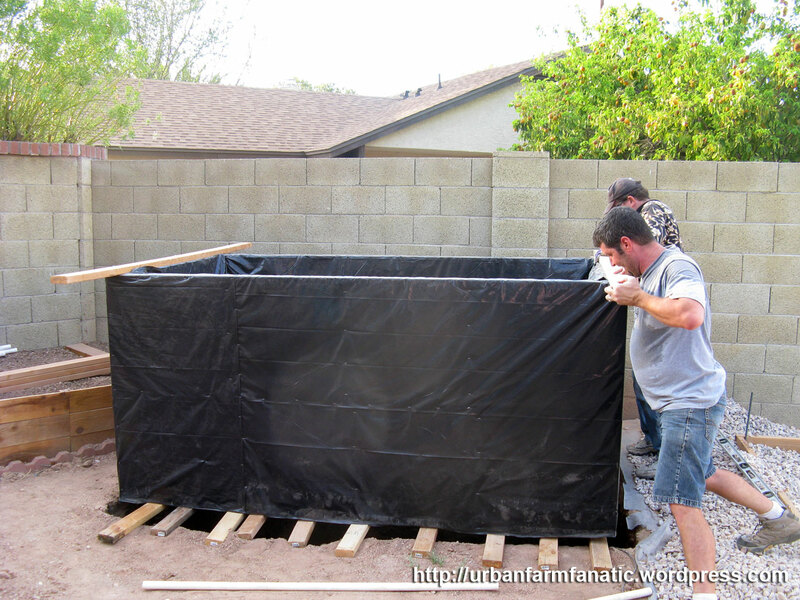 The rest of the tanks sides can be fitted with the OSB without cuts since those sides are the same dimensions as the 4×8 boards. I plan on following up with more later on the tank build, but got all excited about getting it going, that I just had to post something!